We are all consumers, that’s certain. Some of us are also producers, but are we prosumers? That depends. Everyone who has ever assembled furniture for their own home is a prosumer. If you have knitted your own socks or used the self-checkout at the supermarket, you are a prosumer. According to Alvin Toffler’s “Third Wave” (1980), prosumerism is “the production for self-use”. Extending such prosumer activities holds major potential for more sustainable lifestyles, if done right. 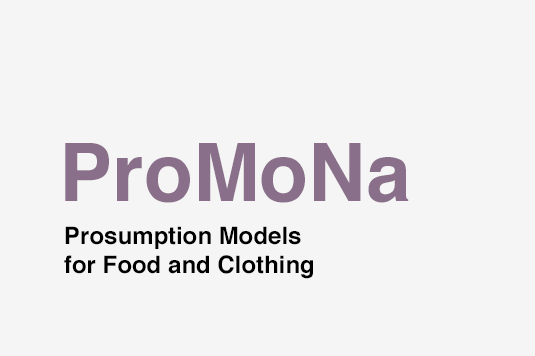 The project “ProMoNa” is about finding such prosumption alternatives beyond the conventional separation of production and consumption by looking at their intersection from the perspective of the prosumer. Prosumerism today is gaining more and more attention with regards to its possible sustainability benefits. Prosumerism can take manifold forms and comprises phenomena such as Open Innovation or Outsourcing of Services (e.g. self check-in at the airport), Do it Yourself, energy cooperatives, Urban Gardening or Community Based Agriculture (CBA), all of which have in common that individuals – in service of their own consumption, either on their own or in a community – take over activities within the supply chain that conventionally are undertaken by businesses. The project’s first aim is to map prosumerism, clustering the different prosumption activities in order to get an overview of the different business and/or value creation models that emerge. The project team will perform a trend analysis, combined with expert interviews and workshops. Secondly, we will select some of the most promising prosumerism models from the fields of food and clothing and apply our holistic assessment tool handprint to assess their sustainability potentials. The project will deliver a practitioner guideline targeted at consumer policy, consumer organisations, business, and the prosumers themselves promoting prosumer models that support sustainability. The 15-months research project is funded by the German Federal Ministry of Justice and Consumer Protection. This project is realised in collaboration with the Wuppertal Institute for Climate, Environment and Energy.